Say these two words to the next person you see: "Krispy Kreme." Or they'll smile and start telling you a story about when they last had one of nature's most divine foods: the hot glazed Krispy Kreme doughnut. Does a simple glazed doughnut deserve tributes and accolades? Only if the magnificent craftsmanship of a Stradivarius violin, a jeweled Faberge egg or a Pierce's Pitt Bar-B-Que Jumbo with slaw does. 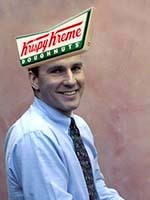 There was a time when you'd have to call Krispy Kreme doughnuts one of the South's most divine foods. Founded in 1937 by Vernon Rudolph in Winston-Salem, North Carolina, the company was just a regional delight with the gospel of glazed goodness not reaching beyond Dixie. But times have changed. Krispy Kremes appeared in New York in 1995 and now you can find you can pick up a dozen or two in Los Angeles, Las Vegas, Phoenix, Des Moines, Baton Rouge and even Livonia, Michigan. When you step out of your car in a Krispy Kreme parking lot, the aroma beckons you inside the shop (at the big ones actually making doughnuts, that is, not the small stores that fake you out with their curbside appearances but only import doughnuts 3 or 4 times a day). And when you do step inside the green and white doors, the fragrance of hot dough-meets-sugar envelopes you in warmth and then guides you over to the room-length windows to watch the wonderful Krispy Kreme doughnut-making machine at work. Doughy circles journey up a bicycle-chain like series of platform chambers where they gradually grow and puff to become full-sized doughnut rings. Then. SUDDENLY, they dive into hot oil and their transformation from dough to Krispy Kremes speedily takes place. Like swimmers in a backyard pool, they ease down their lanes of hot oil then quickly flip over to brown their undersides. They trundle up a conveyor and finally parade through a grand sugar-glazing waterfall. The taste is beyond compare: a doughnut so airy and amazingly light that a mere finger-touch leaves a dent, but few fingerprints remain when a dozen disappear in a blink. And no matter how many times a person has eaten a Krispy Kreme doughnut they'll have that same joyful response biting into a new hot one. Something along the lines of "Howdy!" or "WOW!" or "GoodGodARuckus!" It all translates to the same wonderful, magical, scrumptious thing: "Hello Krispy Kreme."